Chicago’s city planners have long recognized the importance of building a dense network of rapid transit throughout the metropolitan region to ensure continued economic development. The currently planned Circle Line, and Red, Orange and Yellow Line extensions consist of a mere fraction of the transit lines proposed for Chicago over the years. Sadly, many of these proposals have languished on the drawing board, leaving behind a legacy of wasted potential. Below is a list of some of the rapid transit expansion projects that have been proposed, designed and then never executed over the years. A rapid transit line from the O’Hare branch of the Blue Line (connecting at Jefferson Park or Montrose) to the Dan Ryan branch of the Red Line at 87th Street, mostly parallel to Cicero Avenue. As envisioned, it would have intersected four other rapid transit lines as well as numerous commuter rail lines. A subway from Jefferson Park/O’Hare to the Loop. It would have departed east from Jefferson Park (present-day Blue Line) under Lawrence, utilized the existing east-west portion of the Ravenswood (present-day Brown Line) between Kimball and Damen, and then turned south under Sheridan and Lake Shore Drive to the Loop. A 10-mile extension connecting Schaumburg and Woodfield Mall with O’Hare and existing rapid transit service via the Blue Line. A 15-mile extension connecting the current terminus of the Blue Line at Forest Park to Oak Brook, providing service to Oak Brook Mall, office parks, and the I-88 research corridor. An extension of the proposed Mid-City Transitway six miles north to the Dempster Skokie Swift (Yellow Line) terminal. An extension of the present-day Green Line from Ashland/63rd to Midway Airport via an elevated line along 63rd Street. An extension of the now-defunct Humboldt Park branch from Lawndale to the city limits at Harlem. It is believed that this extension would have provided enough ridership to avert the closure of the Humboldt Park branch in the 1950s. A branch along Belmont from the present-day Blue Line O’Hare branch to approximately Cumberland Avenue. A branch from the present-day Brown Line at California/Leland north to the city limits at Howard Street. Further details about these lines and others are available at Chicago-L.org. 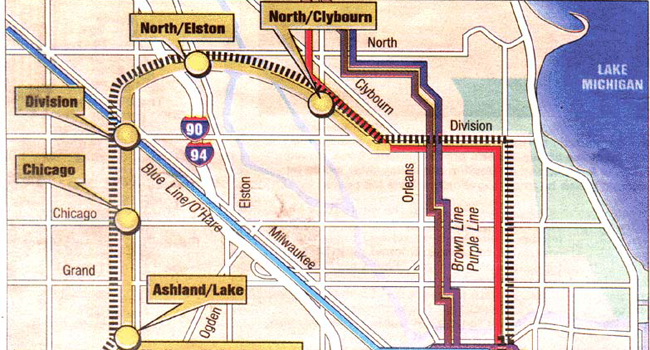 This rapid transit line would have run between the O’Hare branch of the Blue Line (connecting at Jefferson Park or Montrose) and the Dan Ryan branch of the Red Line at 87th Street, mostly parallel to Cicero Avenue from North to South. As envisioned, it would have intersected four other “L” lines and perhaps some of the five intersected commuter rail lines. This subway would have run from Jefferson Park/O’Hare to the Loop. The line would have begun at the Jefferson Park station heading east under Lawrence Avenue, merging onto the existing Ravenswood Branch. It would then continue east under Wilson, then south under Sheridan Road and Lake Shore Drive. The portion that would have run beneath Lake Shore Drive to the Loop would be later proposed as the North Lakefront Line. East-West Forest Park to Oak Brook: This 15 mile extension would have connected the current terminus of the Blue Line’s Forest Park branch at Des Plaines Avenue to Oak Brook, providing service to the Oak Brook Mall, office parks, as well as the I-88 research corridor. Skokie-O’Hare Connector: This extension would have extended the Mid-City Transit Line six miles north to the Dempster Skokie Swift terminal. Englewood Extension: This extension would have connected the current Green Line terminus at Ashland/63rd to Midway Airport via an elevated line along 63rd Street. Humboldt Branch Extension: This extension would have been an elevated line from the terminus of the now defunct Humboldt Park branch at Lawndale to the city limits at Harlem. It is believed that the extension to Harlem Avenue that would have provided the ridership and averted in its demolition. Belmont Avenue Extension: This rapid transit line would have branched off from what is now the Blue Line’s O’Hare branch to approximately Cumberland Avenue. Clinton Street Subway: This subway was designed to serve both commuter rail stations and the West Loop, connecting to the unused grade-separated junction at Lake Street with the Milwaukee-Dearborn Subway at the north and using the two unused north portals at Halsted Street on the Congress Line on the south. California Avenue Extension: This rapid transit line would have branched off what is now the Brown Line at California/Leland and run north to the city limits at Howard Street.